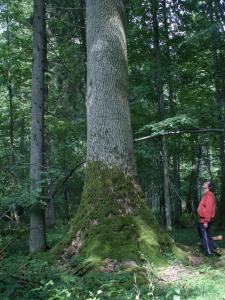 Bialowieza ash is extremely soaring, and distance between its trunk and the first branch reaches sometimes even 22-23 meters, which exceeds the size of the forest oaks and limes. The crowns of Bialowieza ashes are not big though it happens not too often that there occur ashes with a very wide-stretching crowns. Exactly one of these ashes grows by 'the Masiewska Road'. Its crown looks really very impressive however this stretching will be probably fatal for this tree since it is more exposed to wind action. The huge trunk of this ash is already very disturbed and you can observe on it not only big cracks but also wood & bark losses caused by trunk binding due to gusting wind. This tree is very high and it is possible that its height may exceed even 40m. Very varied & interesting is the placing of the ashes' trunks in the ground. Some trees have a classical placing which is very similar to the Bialowieza oaks trunks (photo right), with others it takes on funnel-like shape-unusual for other tree species. Exactly this kind of ash grows near so called 'The Detour'(left photo). Some ashes, because of the conditions they had to grow in, have asymmetrical trunks: very extended at the base, which has to bear the weight of a bent trunk. 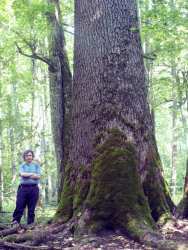 The biggest size is reached by the Bialowieza ash in moist forest and ash-alder riparian forest. In the Bialowieza Forest in fact there are no independent ash treestands. It has been observed as well that ash leaves most often occur in moist forests. According to literature the maximum sizes of Bialowieza ashes are: height: 41-43 meters, trunk perimeter at the height of 130cm: about 500cm(in case of trunk perimeter it does not seem to be the final limit). The highest ash which I was able to measure on my own is about 45-46 meters high (photo below).